Get cozy this autumn with warm textiles in earth tones, lots of snuggly blankets, and the reassuring strength of natural wood – our new Paxton Living Room Set has it all, only at FaMESHed! 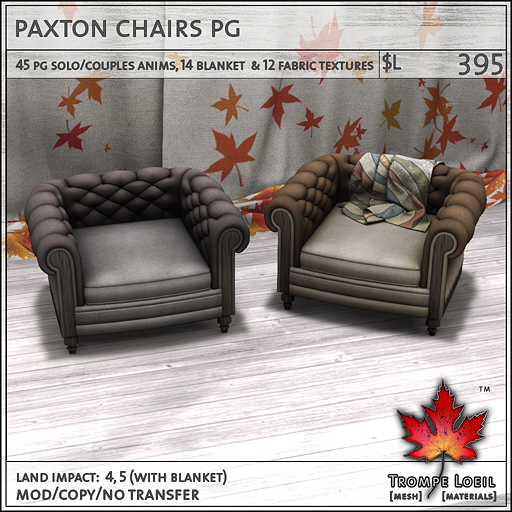 Choose from the Paxton PG or Adult Chair and Couch, both with plain and blanket/pillow models, with 12 fabric textures and 15 blanket/pillow textures included via menu. 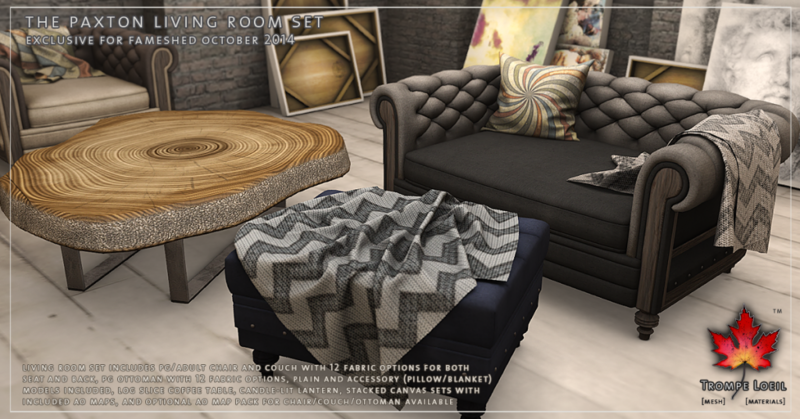 Grab the matching PG Ottoman with plain/blanket models included, plus 12 fabric textures and 15 blanket textures. 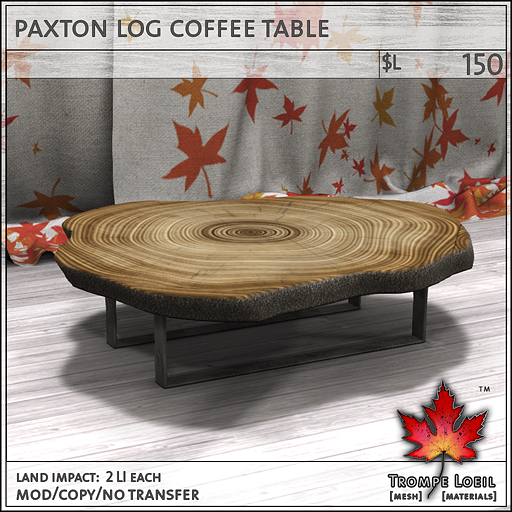 Round out the room with our Paxton Log Slice Coffee Table – carefully made with material normal maps for extra depth and realism. 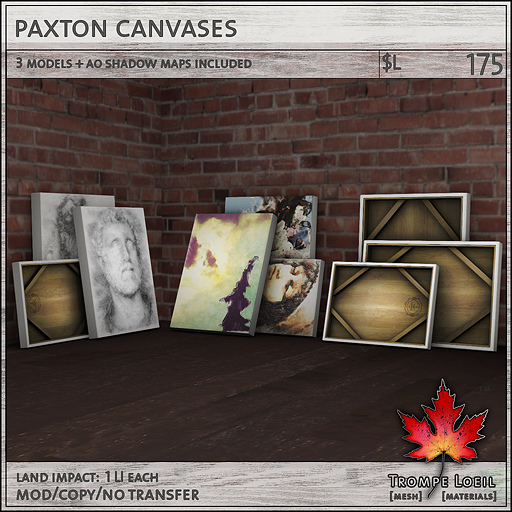 The Paxton Canvases include 3 models total, with all AO Shadow Maps included so you can add your own artwork or framing textures! 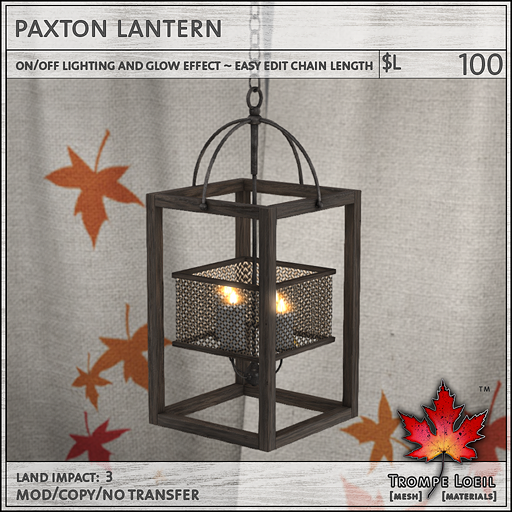 The Paxton Lantern glows from within with 4 candles that light and extinguish on touch, with an adjustable-length chain that makes it easy to modify to any length you need. 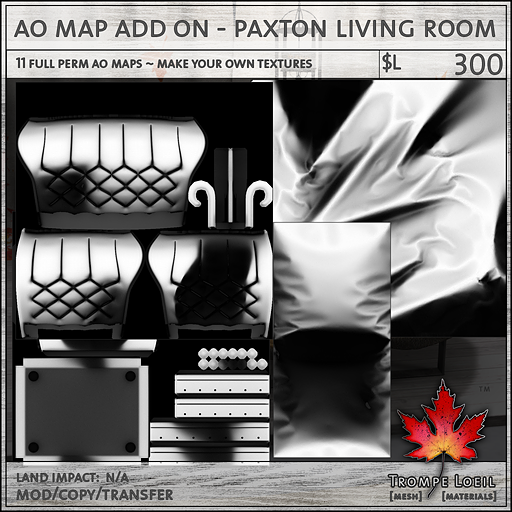 Don’t forget the Optional AO Maps Pack, which include all AO Maps for the couch, chair, ottoman, and their respective pillows and blankets! 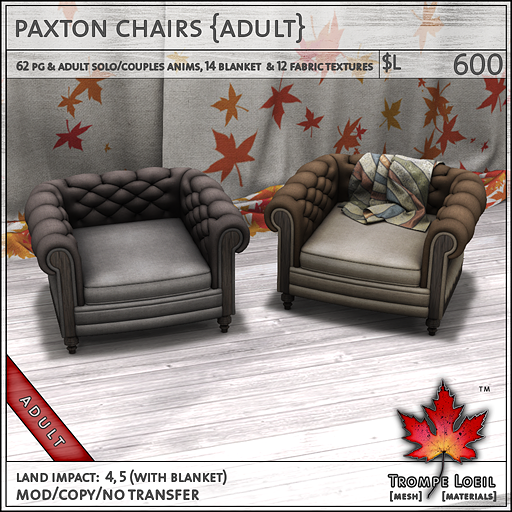 Create your own unique, one of a kind patterns and fabrics quickly and easily in the image editing software of your choice. 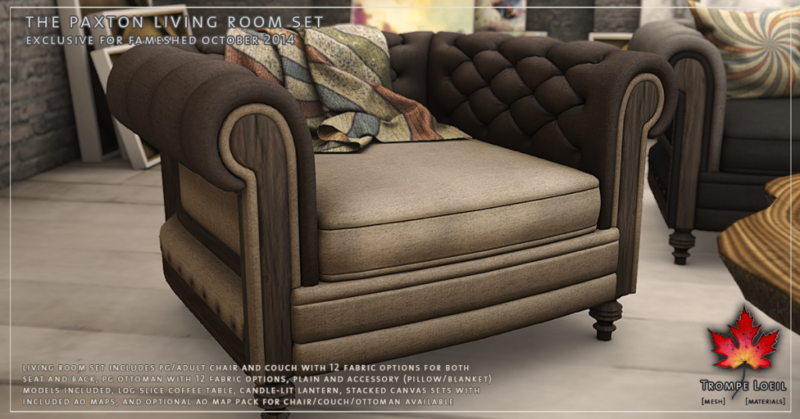 Love it all? 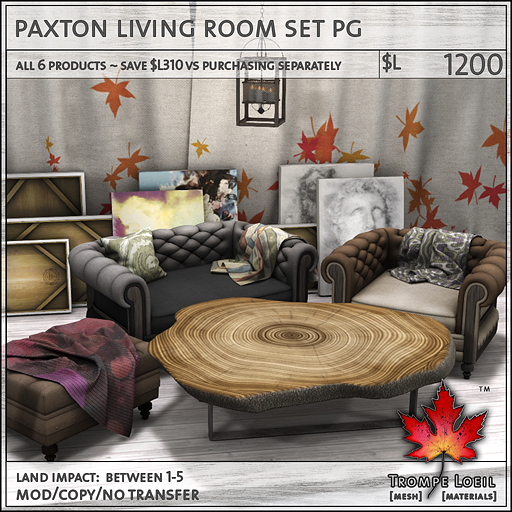 We have Set Packs available, save $L310 off the PG set and $L450 off the Adult set vs purchasing all the items individually! 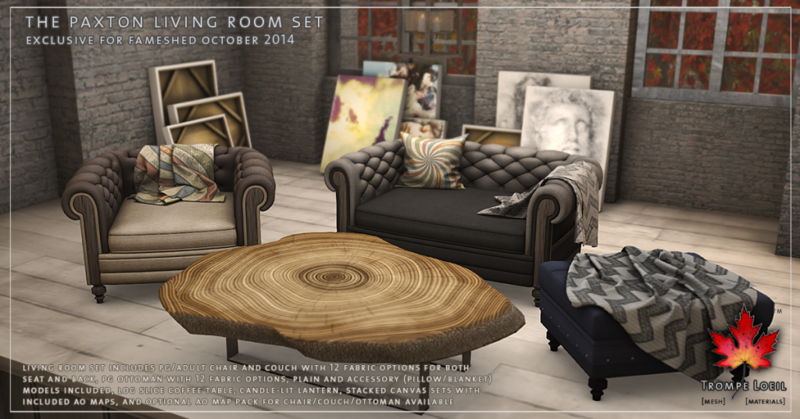 Only at FaMESHed for the month of October!